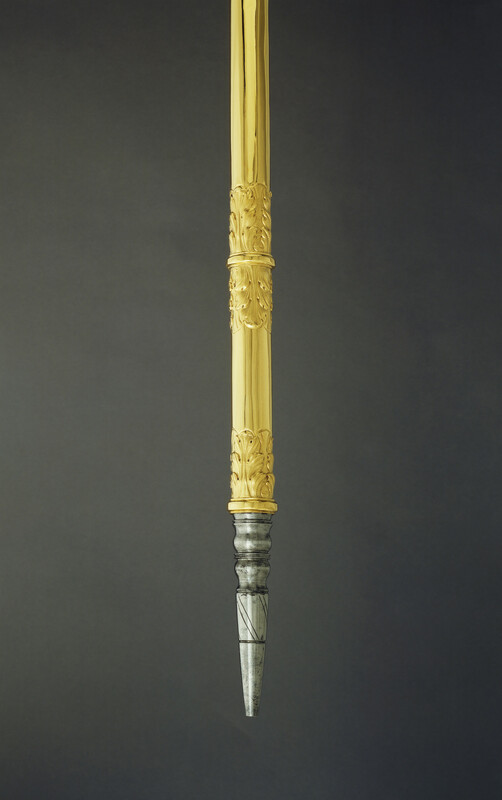 A plain, tapering, gold rod in three sections, with moulded collars flanked by chased acanthus leaves on a matted ground and six applied palm leaves below the baluster which supports a plain monde with arc and zone, and cross above. A "pike" of steel at the bottom. Also known as the 'Long Sceptre', St Edward's Staff is traditionally thought to have been a relic associated with Edward the Confessor (St Edward), and was carried in the processions at the coronations of Richard III, Edward VI, Mary I and Elizabeth I and James I. Like the other regalia the Staff did not survive the Commonwealth. In 1660 therefore it was recreated although its exact purpose was no longer remembered, nor its original appearance. The Staff has continued to be carried in coronation processions although it performs no function in the ceremony. Supplied for the coronation of Charles II in 1661 by the royal goldsmith, Robert Viner (later Sir Rober Viner).